2/8/2019 - Flags to Fly at Half-Staff to Honor Former U.S. Congressman John Dingell, Jr.
1/14/2019 - Gov. Ricketts Proclaims “Religious Freedom Day"
5/18/2017 - Gov. Ricketts, Kawasaki Unveil Company’s First Aerostructures Production Line in U.S.
8/5/2016 - Gov. Ricketts to Sen. Kintner: "Resign Immediately"
5/13/2016 - Gov. Ricketts Urges Nebraskans to Tune In On "Hannah Huston Day"
4/19/2016 - Gov. Ricketts, Educators Laud Abolishment of Learning Community Common Levy as "Step Forward"
4/18/2016 - Nebraskans Hail Gov. 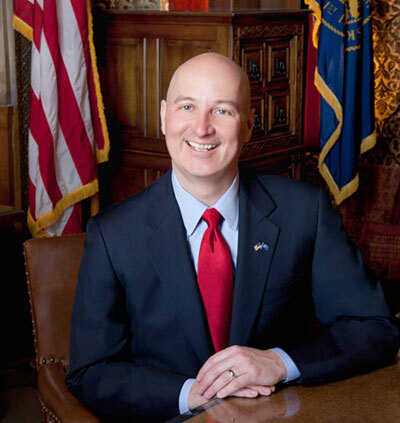 Ricketts’ Transportation Initiative as "Historic"
1/5/2016 - Gov. Ricketts Congratulates Kawasaki on its First Aerostructures Production Line in the U.S.